Spring has sprung when we first visit the blooming tulips rural town in Wynyard but not yet in full bloom! Wished we could have stayed longer for the tulip festival but we need to get around Tasmania as much as possible and experience this laid-back state in Australia. Parrot Tulips - photo was taken as we pass by the tourist & Travel Information Centre building in Wynyard Town, Tasmania holiday 2015. I can only show you two types of Parrot Tulips from the photo below. The White Parrot tulips were not yet in bloom when I took the picture. 1. TULIP ROCOCO - is cardinal-red with purple and green feathering colours. The original term was first introduced in 1884 "Couleur Cardinal" meant a scarlet-red and flushed plum. 2. WHITE PARROT or WHITE RUFFLED - white and green feathering colours. 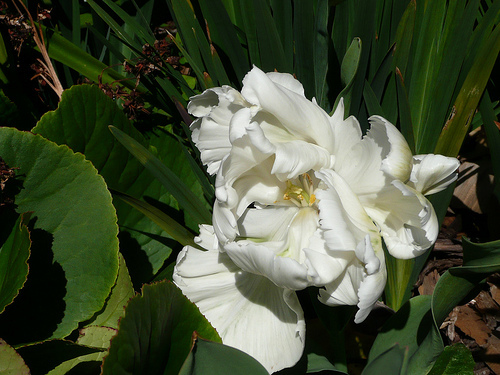 I was able to grow the White-Green parrot tulips when we bought the bulbs from Tesselaar farm near Melbourne. Unfortunately, the bulbs did not come back the second year as someone had stolen the bulbs from our front yard garden patch a few years back except the common ones.